I'm Gonna Annoy You By Putting 9/10 Instead Of 10/10 Even Though I Totally Mean 10/10! Kinda Awesome But Not Flat-Out Awesome, 7/10! Me Like, But Think Need Work. -Ug The Caveman. 5/10. -- I have added a delay to the Quickload feature. This is to stop you from hitting it by mistake and loosing progress. -- I have also slightly tweaked the profile page. -- I have tweaked the drop function so now all you have to do to drop or delete something is press "X"
-- The next thing I have tweaked is the dead zones and sensitivity. This makes looking around more rounded and less square-like. --I've found an issue where "A" gets confused with "X" in the journal. I have fixed what I can with the profile, but as it was happening with my keyboard as well, I believe it's a problem on oblivion's end. (I do play on a modded version of the game, so maybe a broken mod is causing it?) The glitch mostly happened when I was rapidly pressing "X" and "A" so if you don't want it to happen, don't do that. I thought you all might want to know about this, just so you could try and avoid producing the glitch, and didn't think it was my profile causing the issue. -- Sadly after getting stuck in the wrong profile nearly every time I played, I have opted to remove the ability to zoom in or out using vanity mode. Sorry.
. Firstly, you need to disable the default controller support as it interferes with Xpadder and doesn't work. So to do this go to your, "My Documents" folder, then locate the, "My Games" folder. Open that and you should then see the folder named, "Oblivion" - It's Inside this folder you need to find the document entitled, "Oblivion" or "Oblivion.ini" - Right click this file and hover your cursor over, "Open with" then click, "Notepad" - When this file opens locate the line, "bUse Joystick=1" under the, "[Controls]" heading and change it to, "bUse Joystick=0" - After you have done this save the file, and the tricky part is complete!
. Secondly, you have to reset the controls for both mouse and keyboard to their default setting.
. Thirdly, you'll need to change the default control for Run from, "L-Shift" to "/" - I changed this because some of the in-game menus also utilize, "L-Shift" and so conflicted.
. After doing the before mentioned things, you should now be able you use the controller. Congratulations!
. While in the Inventory you can use LB/RB to navigate the main tabs. I couldn't get the tabs to work using LT/RT like on the console, as it interfered with quite a few things.
. When a quest pop up, pops up, you have to use of the Right Analog Stick to move the mouse, and the Right Trigger to left click on, "Continue" - This is because the arrow keys and the enter key do not work for this menu.
. When it comes to hot-keying an item, really the only successful way I can do it, is by moving the mouse, using the Right Analog Stick, to the item you want to add, then hold the D-Pad in the direction you want your hotkey to be, 1-8, and then press "A" to select it.
. To be able to loot containers or people and still be able activate things all using the same button, I've had to put a release zone on the "A" button. This was because "Enter" and the "Space-bar" were conflicting with each other. So this means now that a short sharp tap of "A" while looting items, will ensure that the container or loot menu won't close. On the other hand, a relaxed firm push of the "A" button will ensure that you can activate things.
. When you are buying items from a store, you sadly cannot use the Analog Sticks or Directional Pad to access the Haggle menu. They also don't work if you are trying to Bribe/Persuade a person. You instead have to use the Right Analog Stick to move the cursor and the Right Trigger to Left Click.
. Sometimes you cannot skip the first pieces of chat dialog using the "A" button. To solve this, just press the Right Trigger to skip through the bits of dialog you don't want to hear.
. To exit a chat dialog without using the mouse, you'll have to move the Left Analog Stick or the D-Pad to the right, and press "A" on the exit dialog button.
. While making the profile, I remembered all the happy hours I spent playing Oblivion on my Xbox and thought of all the times I wish I could have Quick-Saved or Quick-Loaded my game. Because of this I have made it so that when the Left Trigger is held down, if you press the D-Pad to the left it will Quick-Save your game. Likewise if you press it to your right, it will Quick-Load. Also if you have added your game to your Steam games list, or just have the game on Steam, if you press Left Trigger and then press the D-Pad up, you can take a screenshot! Last edited by DaNuttyNoob on 30 Aug 2014, 01:55, edited 7 times in total. I am having an issue where every time i press A to activate something I crouch down. Any thoughts? ...Anyway to answer your question, could you please make sure you went through all of the instructions above? They are just under the latest edit's description! If you already followed the instructions and you were still having the issue, then I would ask if you could check step one again. 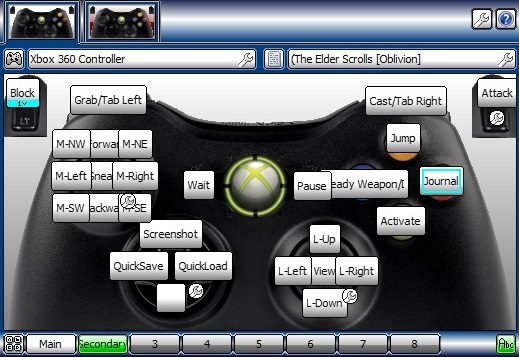 It really sounds to me like Oblivion's broken controller support is overriding Xpadder. To check if you disabled the in-game controller support using step one of the instructions, when you load up the game enter the options menu and select controls. Here you should notice that the swap stick options are grey'd out. This basically tells you it's disabled. Hopefully this fixed your problem, but if you are still having issues, i'll give it my best shot at helping you with 'em! I'll be trying this out later today! Thanks for all the good work. I'll be sure to leave feedback. A minor, inconsequential thing: I'm not really active on the forums, but one thing I appreciate about other profiles is a graphic representation of a controller and your mapping scheme. That might be something to consider adding to this page. Hey, thanks for your message! I didn't know how to add pictures at first, but after some research I have found out how and have added two. One from Set 1 and one from Set 2. I hope you enjoy the profile, and thank you very much for the great idea, i'll be sure to add pictures to my other profiles as well! I'm having an issue where the left stick movement is reverse of what it should be, pressed all the way in one direction is walk, pressed part way is run. Is there a way I could fix this on my own? Thanks for the quick reply Mr. NuttyNoob, unfortunately your suggested fix is not the issue. I made those .ini changes when installing the profile & just double checked to make sure I'd saved the changes. What else could it be??? I've played for several hours now in the hopes that I can retrain myself to get used to it but its just so counter-intuitive, I can't make it work... HALP! Not a problem about the quick reply and I'm sorry that wasn't the correct fix. I have another idea of what it could be and that is, that always run is turned off. I believe, if you have reset your controls to their default setting, just press the "Caps Lock" key to enable it and it should sort out the issue. Essentially when the left stick is moved slightly with "Always Run" enabled it'll hold the Run key ("/") as well as the Move Forward key "W" which should allow the character to walk. But if always run is disabled, it'll do the exact opposite and instead of walking it'll make your character run, matching the description of your issue. I tried it out on my version of Oblivion just now and it might, with a bit of luck, be the fix for your issue.